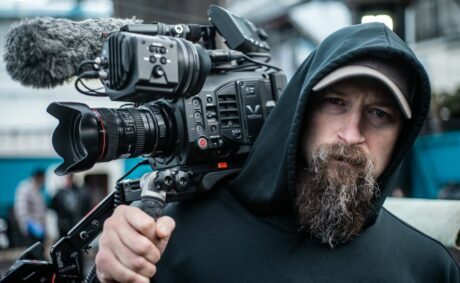 NEWARK, NJ – The new season of the Emmy Award-winning docuseries “Deadliest Catch,” premiering today, April 9 at 9 PM ET/PT on Discovery Channel, was shot on the forbidding Bering Sea with seven VariCam LT 4K and 17 AU-EVA1 5.7 K cinema cameras. Produced for Discovery by Original Productions, “Deadliest Catch”—a perennial hit–portrays the real-life events aboard fishing vessels during the Alaskan king crab and snow crab fishing seasons. The Aleutian Islands port of Dutch Harbor, Alaska, is the base of operations for the fishing fleet, and the show’s title derives from the inherent high risk of injury or death associated with the work. The show emphasizes the dangers on deck to the fishermen—and camera operators. native ISOs of 800/5000. Weighing just under six pounds and having superior capability to similar sized cameras, the VariCam LT is the ideal camera for handheld, SteadiCam, jib, crane, drone, gimbal and overall cinema verité work. The VariCam LT offers a host of new features including an EF lens mount, hot swappable batteries, IR shooting capability, a 23.98 PsF output, cinema style file naming, and image presets such as scene files.